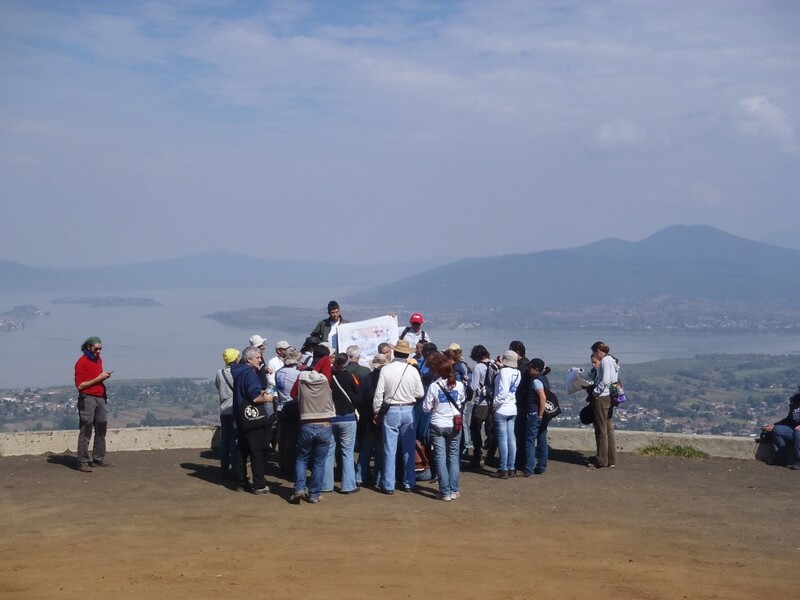 The following two reports are from the fieldtrip to lake Patzcuaro by our friends Pedro Huerta and Raúl Pérez López. This excursion marked the end of the Morelia2012 workshop on Active Tectonics, Paleoseismology and Archaeoseismology. Miguel Angel Rodríguez Pascua offered himself to be sacrified by Niklas Mörner. The fieldtrip started with the travel to Patzcuaro in a good bus of the University of Michoacán, all the attendants to the Acambay fieldtrip know what I mean when I say a good bus. The first stop was in “ El estribo”, a big landslide at northern side of a Vulcano. We were discussing If the relief that we were seeing was related to the debris avalanche morphology or if was due to several landslides associated with a fault. At the toe of this landslide was the Patzcuaro lake, a shallow lake with a lot of paleoseismite deposits. Then we moved to visit the Patzcuaro lake margin to visit a couple of big volcanic stones laying directly on the fine lake sediments. These two big stones are located on hanging wall of two faults. The stone saddle shape is interpreted as a scarify stone and Miguel Angel Rodríguez Pascua offered himself to be sacrified by Niklas Mörner. After this we visited the faulted and uplifted diatomites of the Patzcuaro lake laying unconformably on the “El Estribo” volcanic deposits. 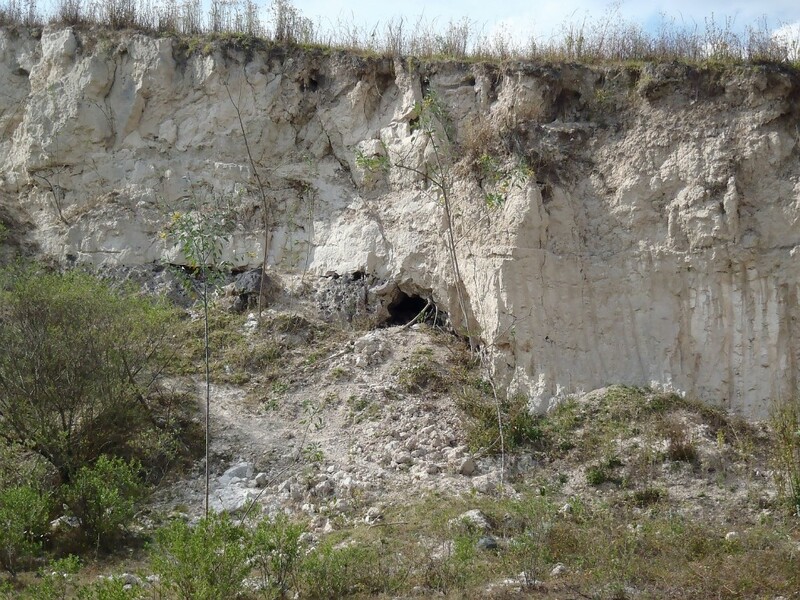 Fieldtrip second stop – Diatomite quarry. 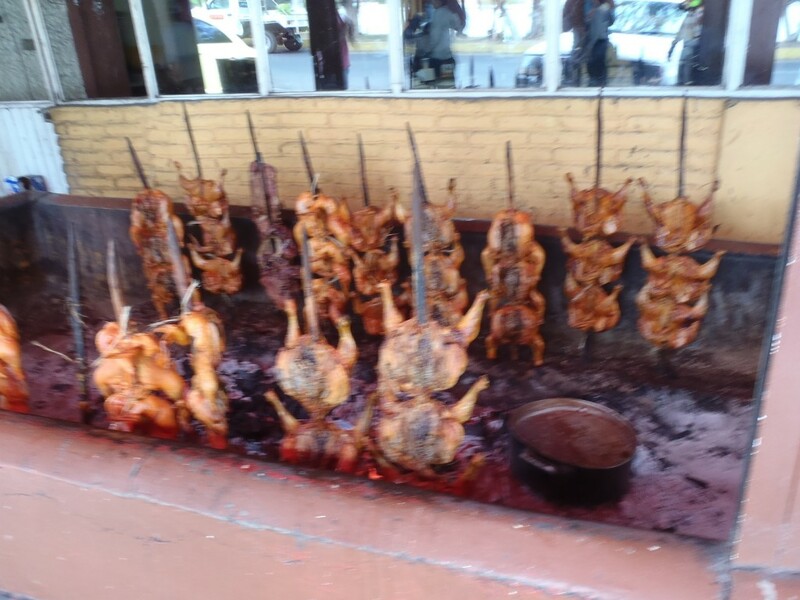 The lunch consisted in a Pastor- style grilled chicken, with the typical hot Mexican sauces near Patzcuaro. We continued the fieldtrip visiting the archeoseismological evidences in Patzcuaro buildings, including the “almost” cathedral and their fallen bells. The morning was nice and only small clouds wandered in a blue and grey sky. This time, the bus offered by the organization was “normal” and we could finally reach the first stop going with an averaged speed faster than 23 km/h!!! The first stop was “El Estribo” Landslide, close to Patzcuaro Lake. In this first stop, we discussed about a mega landslide affecting the volcanic edifice of El Estribo. This discussion was conducted by Jose Luis Macias, geologist and volcanologist of the UNAM at Morelia (Fig 1). From this high topographical position we can observe Patzcuaro Lake, Janitzio Island and volcanic deposits from late Pleistocene. The discussion arose about the control of the climatic conditions into the area, and the role of volcanism and gravitational landslides when we are calculating the tectonic slip rate in active faults inside the basin (Fig. 2). The second stop was really amazing and every guy in the congress loved this site: Jarácuaro Blocks and Trenches. This stop was conducted by Miguel Angel Rodríguez Pascua and Victor Hugo Garduño. At the beginning Miguel A. explained two trenches performed two years ago in this annexed island, showing the trench log and explaining the different volcanic and sedimentary units. In this same place, 8 months ago Miguel A., Victor Hugo and Raúl Perez experienced the Oaxaca earthquake of M 7.4 which occurred in March of the same year, 2012. The interesting thing was that a few seconds before we can feel the earthquake, several horses and cows suddenly run on the site in a chaotic movement. Then, almost 14 second of rhythmic shaking and followed by calm. Unfortunately, we couldn’t prepare other earthquake for the excursion. However, the surprise came when Miguel A. explained the significance of two blocks placed here by ancient prehispanic people (Purépechas) in the same places where surface ruptures were evidenced by trenching. The first stone, so-called the “saddle”, was hand-made carved may be with sacrifice intentions. In this picture, Nikklas Mörner in an ancient ritual tries to protect the entire group by sacrificing Miguel A. (Figure 3). Fortunately it was only a representation and the heart of Miguel is still beating inside him, though Nikklas acted very well. Both outstanding stones provoked a hot discussion about mixing natural catastrophic phenomena, religion and culture of ancient inhabitants. Fig. 3: Niklas as a prehispanic priest killing Miguel in a ritual ..
Before having a lunch, we were to a lacustrine outcrop deformed by volcanic intrusion. Spectacular faults with slickensides in the plane and neptunian dikes were rapidly measured by the geologist and a hot discussion about synsedimentary deformation that took place. The lunch was in a typical Mexican food place at Patzcuaro City, delicious roasted chickens and native beers (Figure 4). Finally, we visited the Patzcuaro city where Jorge Giner, once again, taught us about interlocked antiseismic construction before the earthquake of 1858. We visited the cathedral, several monumental houses and catholic convents. 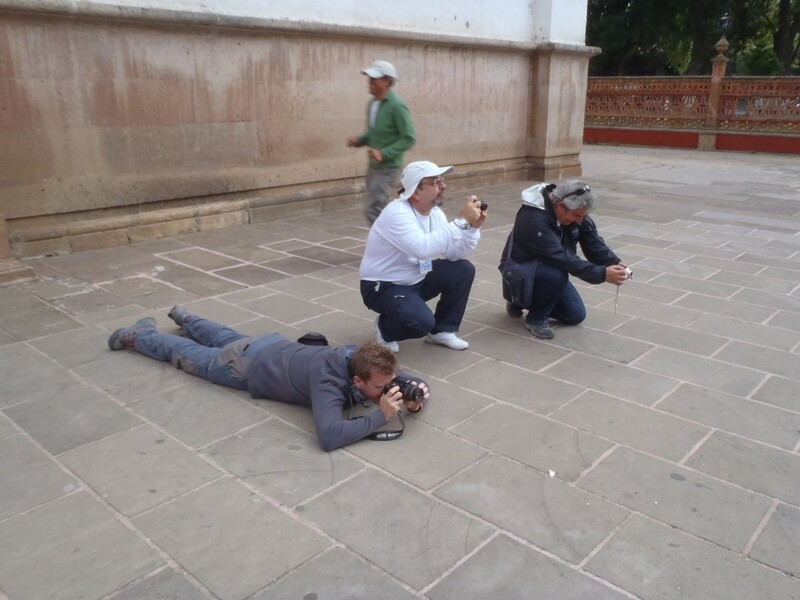 Fig 5: Geologists (Jorge, Franck Audemard and Pablo Silva, with Victor Hugo Garduño running behind) at Patzcuaro cathedral, and like snipers shouting to their target.. archaeoseismology!!! See you at Aachen, 2013!!! Don’t forget it! !